Goal: Get the dog to stand between your legs and remain there. 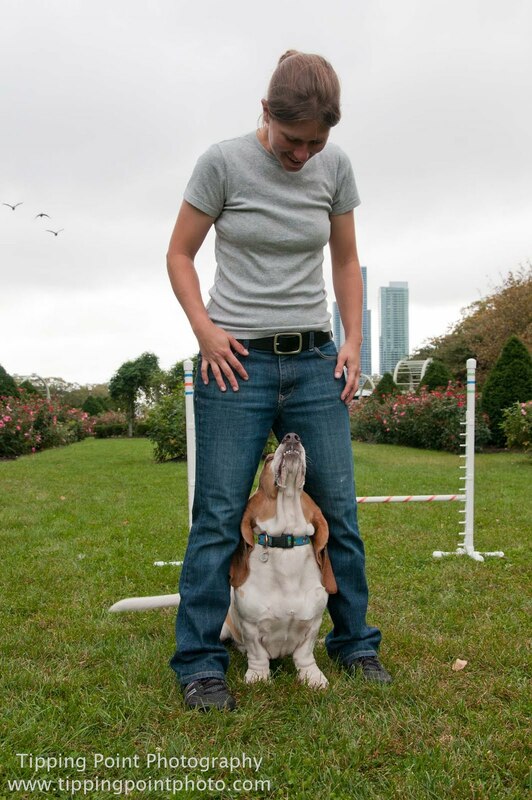 The next step to this is moving forward and backward while the dog maintains position. 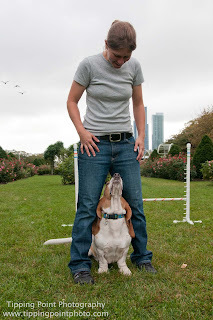 Stand with your legs shoulder width apart and with a treat lure your dog's head behind your leg and through. Try using two hands, use one to lure the dog behind you and the other to get him through your legs. When his head is between your legs, hold your hands at your stomach, making sure to reinforce periodically. To add movement keep your hands at your stomach and take one step forward or backward. Praise and treat the dog for staying between your legs. If he comes out before being released mark with an 'oops!' or 'uh-oh' and lure him back. You can add changes in position to make if harder still.